“1982 - It was a month or two before the shootings began on the northern borders (which shortly lead to the operation “Peace for Galilee”, better known as the “Lebanon war”). The first peace agreement was signed and you could feel the sanguineness all around, culture and art performances were getting filled with crowd, happy crowd. That’s when I first heard it live, central Tel-Aviv, five musicians, maybe less then fifteen people in the crowd. The floor was tiled with wooden and metal drum parts. The ceiling fans were made out of used army boots and the stage was simply four old russian pianos laying joined. It was a mixture of everything – voice, cracks from the fan, clarinet, hands on drums, the stage’s resonance, my beer bottle; everything was music, all sounds. The next month - same place, same time, Tamar came with me. 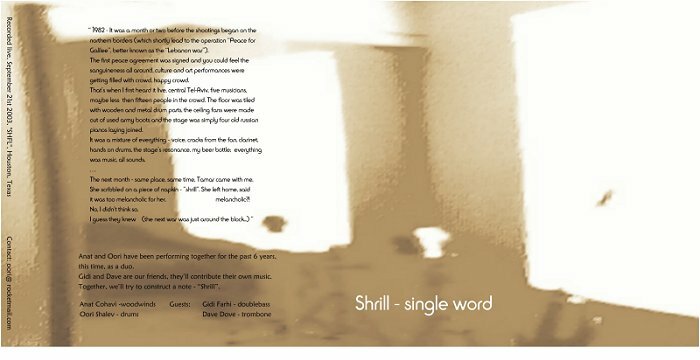 She scribbled on a piece of napkin - "shrill”. melancholic?! No, I didn’t think so. this time, as a duo. 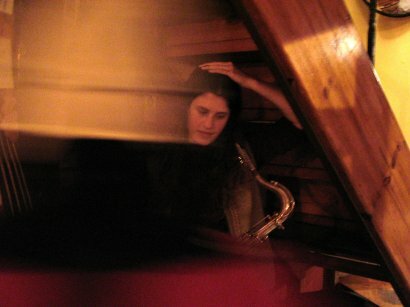 this time, extending the influence of one on the other using 'electronic manipulation', a way to affect the other musician's instrument's sound in real-time. using both gestures, dsp processing & mechanics. there's no pioneering nor crazy research, they're simply tools to dig.